Free shipping for Small Plastic Shopping Bags to anywhere in the USA, including Alaska, Puerto Rico, Virgin Islands and Hawaii. Most probably, items will be delivered within three to four days. However, for some places it may take up to one week delivery time. These small bags are about 8x4x15” (Width x Side Gusset x Length) size or in two dimensions it is equivalent to 12x15” (Width x Length). You can combine only items which also have free shipping. Please select/click on any image to view it larger and to read details about the item. All bags are made from virgin poly ethylene and backed by our full satisfaction pledge. Before ordering you may want to read about BagsOnNet Policies and Satisfaction Pledge. 1000 Bags/Box, Size: 8" W x 4" D x 15" H (Width x Side Gusset x Height) - Equivalent Two Dimensions Size of 12x15" (Width x Height). 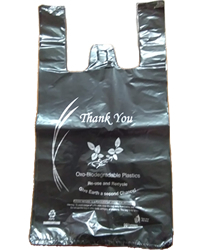 These superior quality Oxo Biodegradable, Environment Friendly, Strong Black bags are Printed Thank you with Silver Ink. 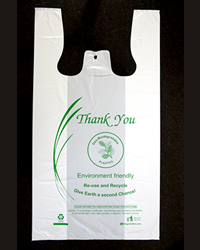 Bags are made using Oxo Biodegradable High Density Polyethylene (HDPE). Thickness of each bag is about 14 Micron (about 0.55 MIL). These bags are perfect for Liquor Stores (Single Bottles or Can). Please note: Oxo Biodegradable plastic requires oxygen and sun light, both, for degradation. Bags will start degrading after about 18 months once get oxygen and sun light. While bags are kept inside the box and don’t get oxygen and sun light, both, then bags will not start degrading. The price mentioned is for a box of 1,000 Bags and includes free shipping anywhere in USA (including Hawaii and Alaska, PR and VI).--- By adding or removing this item from the shopping cart will have no effect on a shipping charge. Please feel free to combine with other items. Appropriate shipping charge will be added only for non-shipping included items. Please select either UPS Ground or Shipping Included Item after adding this item to Shopping Cart. The shipping cost would be zero, if this is the only item in a Shopping Cart, for any quantity. 1000 Bags/Box, Size: 8x4x15" (Width x Side Gusset x Height) - Equivalent Two Dimensions Size of 12x15" (Width x Height). Maroon, Printed "Thank You" with Silver Ink, Made from Virgin High Density Polyethylene (HDPE), 12 Micron, Strong. The price mentioned is for a box of 1,000 Bags and includes free shipping anywhere in USA (including Hawaii and Alaska, PR and VI).--- By adding or removing this item from the shopping cart will have no effect on a shipping charge. Please feel free to combine with other items. Appropriate shipping charge will be added only for non-shipping included items. Please select either UPS Ground or Shipping Included Item after adding this item to Shopping Cart. The shipping cost would be zero, if this is the only item in a Shopping Cart, for any quantity. 1,000 Bags/Box, Size: 8x4x15" (Width x Side Gusset x Height) - Equivalent Two Dimensions Size of 12x15" (Width x Height). Oxo Biodegradable, Environment Friendly, White, Thank You Printed, 14 Micron, Strong. The price mentioned is for a box of 1,000 Bags and includes free shipping anywhere in USA (including Hawaii and Alaska, PR and VI).--- By adding or removing this item from the shopping cart will have no effect on a shipping charge. Please feel free to combine with other items. Appropriate shipping charge will be added only for non-shipping included items. Please select either UPS Ground or Shipping Included Item after adding this item to Shopping Cart. The shipping cost would be zero, if this is the only item in a Shopping Cart, for any quantity. 1000 Bags/Box, Size: 8x4x15" (Width x Side Gusset x Height) - Equivalent Two Dimensions Size of 12x15" (Width x Height). These superior quality and Strong White bags are Printed Thank you with a Red Ink. Bags are made using High Density Polyethylene (HDPE). Thickness of each bag is 14 Micron. The price mentioned is for a box of 1,000 Bags and includes free shipping anywhere in USA (including Hawaii and Alaska, PR and VI). --- By adding or removing this item from the shopping cart will have no effect on a shipping charge. Please feel free to combine with other items. Appropriate shipping charge will be added only for non-shipping included items. Please select either UPS Ground or Shipping Included Item after adding this item to Shopping Cart. The shipping cost would be zero, if this is the only item in a Shopping Cart, for any quantity. 1000 Bags/Box, Size: 8x4x15" (Width x Side Gusset x Height) - Equivalent Two Dimensions Size of 12x15" (Width x Height). These superior quality and Strong Black bags are Printed Thank you with a Gold Ink. Bags are made using High Density Polyethylene (HDPE). Thickness of each bag is 14 Micron. The price mentioned is for a box of 1,000 Bags and includes free shipping anywhere in USA (including Hawaii and Alaska, PR and VI).--- By adding or removing this item from the shopping cart will have no effect on a shipping charge. Please feel free to combine with other items. Appropriate shipping charge will be added only for non-shipping included items. Please select either UPS Ground or Shipping Included Item after adding this item to Shopping Cart. The shipping cost would be zero, if this is the only item in a Shopping Cart, for any quantity. 1000 Bags/Box, Size: 8x4x15" (Width x Side Gusset x Height) - Equivalent Two Dimensions Size of 12x15" (Width x Height). Plain, White, Made from Virgin High Density Polyethylene (HDPE), 12 Micron. The price mentioned is for a box of 1,000 Bags and includes free shipping anywhere in USA (including Hawaii and Alaska, PR and VI).--- By adding or removing this item from the shopping cart will have no effect on a shipping charge. Please feel free to combine with other items. Appropriate shipping charge will be added only for non-shipping included items. Please select either UPS Ground or Shipping Included Item after adding this item to Shopping Cart. The shipping cost would be zero, if this is the only item in a Shopping Cart, for any quantity. 1000 Bags/Box, Size: 8x4x15" (Width x Side Gusset x Height) - Equivalent Two Dimensions Size of 12x15" (Width x Height). Plain, Black, Made from Virgin High Density Polyethylene (HDPE), 14 Micron, Strong. The price mentioned is for a box of 1,000 Bags and includes free shipping anywhere in USA (including Hawaii and Alaska, PR and VI).--- By adding or removing this item from the shopping cart will have no effect on a shipping charge. Please feel free to combine with other items. Appropriate shipping charge will be added only for non-shipping included items. Please select either UPS Ground or Shipping Included Item after adding this item to Shopping Cart. The shipping cost would be zero, if this is the only item in a Shopping Cart, for any quantity. 1000 Bags/Box, Size: 8x4x15" (Width x Side Gusset x Height) - Equivalent Two Dimensions Size of 12x15" (Width x Height). Blue, Printed "Thank You" with Silver Ink, Made from Virgin High Density Polyethylene (HDPE), 14 Micron, Strong. The price mentioned is for a box of 1,000 Bags and includes free shipping anywhere in USA (including Hawaii and Alaska, PR and VI). --- By adding or removing this item from the shopping cart will have no effect on a shipping charge. Please feel free to combine with other items. Appropriate shipping charge will be added only for non-shipping included items. Please select either UPS Ground or Shipping Included Item after adding this item to Shopping Cart. The shipping cost would be zero, if this is the only item in a Shopping Cart, for any quantity. 500 Bags/Box, Size: 6.5x4.5x20" (Width x Side Gusset x Height) - Equivalent Two Dimensions Size of 11x20" (Width x Height). These superior quality and Super Strong Black bags are Printed Thank you with a Gold Ink. Bags are made using High Density Polyethylene (HDPE). Thickness of each bag is 24 Micron. Due to higher thickness these bags are perfect for Liquor Stores (Single Bottles or more) or where handling/packing heavy weight items with a high confidence is important. Price mentioned is for a case 500 Bags and includes free shipping anywhere in USA (including Hawaii and Alaska, PR and VI).--- By adding or removing this item from the shopping cart will have no effect on a shipping charge. Please feel free to combine with other items. Appropriate shipping charge will be added only for non-shipping included items. Please select either UPS Ground or Shipping Included Item after adding this item to Shopping Cart. The shipping cost would be zero, if this is the only item in a Shopping Cart, for any quantity. 500 Bags/Box, Size: 6.5x4.5x20" (Width x Side Gusset x Height) - Equivalent Two Dimensions Size of 11x20" (Width x Height). These superior quality and Super Strong Black bags are Printed Thank you with a Silver Ink. Bags are made using High Density Polyethylene (HDPE). Thickness of each bag is 24 Micron. Due to higher thickness these bags are perfect for Liquor Stores (Single Bottles or more) or where handling/packing heavy weight items with a high confidence is important. Price mentioned is for a case 500 Bags and includes free shipping anywhere in USA (including Hawaii and Alaska, PR and VI).--- By adding or removing this item from the shopping cart will have no effect on a shipping charge. Please feel free to combine with other items. Appropriate shipping charge will be added only for non-shipping included items. Please select either UPS Ground or Shipping Included Item after adding this item to Shopping Cart. The shipping cost would be zero, if this is the only item in a Shopping Cart, for any quantity. 500 Bags/Box, Size: 6.5x4.5x20" (Width x Side Gusset x Height) - Equivalent Two Dimensions Size of 11x20" (Width x Height). These superior quality and Super Strong Black bags are PLAIN – non-printed. Bags are made using High Density Polyethylene (HDPE). Thickness of each bag is 24 Micron. Due to higher thickness these bags are perfect for Liquor Stores (Single Bottles or more) or where handling/packing heavy weight items with a high confidence is important. Price mentioned is for a case 500 Bags and includes free shipping anywhere in USA (including Hawaii and Alaska, PR and VI).--- By adding or removing this item from the shopping cart will have no effect on a shipping charge. Please feel free to combine with other items. Appropriate shipping charge will be added only for non-shipping included items. Please select either UPS Ground or Shipping Included Item after adding this item to Shopping Cart. The shipping cost would be zero, if this is the only item in a Shopping Cart, for any quantity.